I was meeting with a client some years ago – a great, bright leader – on what we were going to focus on in some work with his team. He cut to the chase: “A good day is when I get stuff done,” he said. “Help me do that.” The practical groundedness of his answer has stayed with me. As much as we may equate leadership with its expansive qualities – setting a vision, modeling the values – grand proclamations are useless if we can’t get stuff done. Visions die on the vine if we can’t execute. Dreams morph from motivating to maddening when we can’t bring them to fruition. This is as true for our personal aspirations as it is for businesses, organizations, or the hopes and dreams of a society. So how do we get stuff done? You may be thinking this is going to be a boring rehash of how to set SMART goals (i.e., specific, measurable, attainable, relevant, time-bound), how to apply good project management, or how to get people moving with you. Indeed, any of those may be called for, but that’s not where I’d start. Rather, let’s look at what we’re trying to get done from a broader perspective and apply a principle I learned from one of my Zen teachers, Tanouye Roshi, and that is: driving rhythm. Actually, we all learned about driving rhythm from the playgrounds of our youth. Think of how a swing set works. If you sit at the bottom of a swing and start flailing your legs wildly, you can exert a great deal of effort and get very little accomplished. Why? Because you’re not working with the natural dynamics of the system. You soon learn that if you push yourself back a bit, let go and start swinging in a small arc, you can make it larger by pumping your legs at just the right time: at the leading edge of the cycle. This is the principle of driving rhythm: sense and match the rhythm of the system you’re working with, and time your actions to drive it toward progress. This may seem easy enough, but I watch so many highly driven leaders miss the rhythm of their markets or their organizations, and drive themselves and others to exhaustion. At the other extreme, I see so many visionary leaders who can sense the whole picture, but don’t see how to drive it: they can’t get from here to there. If you’ve been a reader of The Zen Leader or this blog for some time, you know we comprise and can express a complete answer to these partial extremes through 4 energy patterns that make up our personality. From their names alone you get an idea of their functioning: Driver, Organizer, Collaborator, and Visionary. Our Visionary connectedness to the big picture is a good source of insight for what future is worth creating. Once we have that insight, our Driver provides the push and sense of urgency to start making it happen. Our Organizer can break down the whole journey into logical steps in a natural order that either we can do or delegate. And our Collaborator has the sense of rhythm to know when to make our moves, matching the people and larger forces around us. (For a deeper dive into the Integral aspects of these 4 energy patterns, see Integral Life, November 2012, With Thanks and Giving, Here’s an Integral View of You). Driving rhythm. 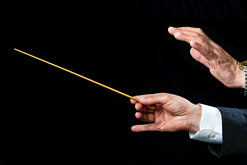 As an example of how this shows up in leadership, think of a symphony conductor. One of my colleagues, conductor Roger Nierenberg, founder of the Music Paradigm, creates a dramatic demonstration of the role of the leader by having program participants sit in with a live symphony orchestra and experience the effects of different leadership styles from the conductor. The musicians play a Mozart symphony they all know well, and the first point Roger makes is that even without a conductor, they can play the symphony reasonably well. But as you listen, you notice it starts to slow down over time, that it lacks a certain pop and sizzle – just like an organization that lacks leadership even if it has talented people. The musicians can’t take much risk with the music, less they lose their colleagues, and the result is a least-common-denominator version of Mozart. As Roger starts to conduct, he times the baton to just ahead of the beat – the leading edge – uniting the orchestra into a pulse that springs the music to life. The musicians can take more risk and the orchestra can turn on a dime when the rhythm changes. Now we hear the real-deal Mozart, played with the spark of driving rhythm. It sounds like a high performing team, a vibrant organization. To make a point, Roger will also go too far and over-drive the orchestra, modeling what micromanagement does to an organization. You see musicians starting to shrink back as Roger’s ego expands, their rhythm thrown off by his burning insistence. And now we hear a hammering, over-controlled version of Mozart that makes us want to stop listening. It may be easier to find the driving rhythm for a piece of music or a swing set, than it is to pick out the dynamic rhythms of a team, a business cycle, or a market trend. But all systems, large and small, have their natural rhythms, their resonant frequencies, their cycles within cycles at which they can operate. All people, large and small, have their natural rhythms. All change efforts, all product launches, all turnarounds, school years, campaigns, seasons, and days have their natural rhythms, and the more sensitive we are to them, the more we can time our leadership efforts to work in harmony with them, and at their leading edge. In this way we make the most progress with the least effort. We get stuff done Integral style, meaning we realize objective goals through subjective engagement with a driving rhythm that matches the individual and group, the parts and whole of the system we’re working with. How do we get better at this - at sensing complex rhythms and knowing when to drive? Here are two approaches that I have found incredibly useful. The first is to get to know and use the 4 energy patterns within us. Between them, they perfectly cover the cycle of driving rhythm: the Collaborator moves in rhythm and has a felt a sense of when rhythms match and not (as in dancing to a beat). The Driver pushes, and has a feel for the leading edge of action (as in martial arts). It knows if it waits too long, it will not be the doer, but rather done-to. The Organizer figures out the steps – the project plan, the timetable, the agenda – and also listens for how its actions are received. In wanting to do the right thing the right way, it carefully adjusts based on feedback. The Visionary keeps opening its senses to the bigger picture, scanning the horizon for new forces to leverage, new threats to mitigate, new possibilities waiting to happen. It will keep refreshing and informing our vision, that we apply our driving rhythm toward the greatest good. Each of these is indispensible to getting stuff done. Driving rhythm calls us to use the right pattern at exactly the right time. This might be easy enough in theory, but in practice, the preferences of our personality often get in the way and make us forget that we have all 4 available in any moment. A reminder I’ve put on my own desk is a little paper cube – we call it the FEBox (named after the FEBI that measures these patterns in us) – with a different pattern on each side. When I’m not making the progress I want to be making, I’ll spin it around and remember what pattern is needed now. If you’d like one on your desk, you can download your own free FEBox – and here’s even a video on how to put it together. The second approach to getting better at sensing and driving rhythm is to hone our visceral sensitivity using all of our senses – not just visual processing, which takes up a disproportionate amount of our brain. Listen to all the sounds around you in this moment – pause – and you’ll hear things that you ignored a moment ago while you concentrated on your reading. This is not a criticism, for the nervous system is always making choices for what to attend to. But it shows us how much we can dial up or dial down the gain on any of our senses by how we use them. The Visionary’s bigness and the Collaborator’s sense of rhythm are great ways to cultivate this visceral sensitivity. Here’s an exercise you can try that makes good use of both of them: step outside and feel your feet on the earth. Flex your knees ever-so-slightly, letting your weight come to the balls of the feet, so that you feel grounded. Hold your hands to the side of your head (as in “stick ‘em up”), seeing both hands at the same time in your peripheral view and all things in between. Let your hands drift down, keeping this broad, 180-degree vision. Similarly, open all your senses, letting everything register in you and through you. Let yourself enjoy a few deep, slow breaths, and then start clapping your hands slowly. Gradually change the pace and feel for a frequency of clapping that is somehow easier to maintain – a pace that matches the rhythm of the day. The first time you try this, you may not sense much – maybe you didn’t even know the day had a rhythm. But if you keep listening, not just through your ears but with your heart and gut and every pore of your skin, you start to “hear” it. This is the kind of sensitivity that can sense the rhythm of people, the timing of effective communication, or the pace of embraceable change. The beauty of driving rhythm for getting stuff done is that you don’t have to figure it all out ahead of time. You drive and listen, push on the system and see how it responds, sense if you’re building momentum or losing steam and adjust accordingly. What it’s not is drive, drive, drive, drive, drive. Neither is it sit back and hope. Driving rhythm combines the power to act with the sensitivity to act wisely. Using the 4 patterns and honing your visceral sensitivity to the rhythm of all things, you can get stuff done – Integral style. And in the largest sense, the boundary of self and other falls away, you become the whole picture and driving rhythm is none other than the beat of your own heart played on the drum of the world. About the author: Dr. Ginny Whitelaw is a leadership expert and Zen master in the Chozen-ji line of Rinzai Zen. She is the author of The Zen Leader, President of Focus Leadership, and founder of the Institute for Zen Leadership.